If you are looking to buy or sell a property without using traditional financing, a Contract for Deed may work well for you. Contract for Deeds are agreements between a buyer and seller in which the seller acts as the financier. You want to act as the financier and sell property on terms to a buyer. You want to purchase property from a seller without using traditional financing. 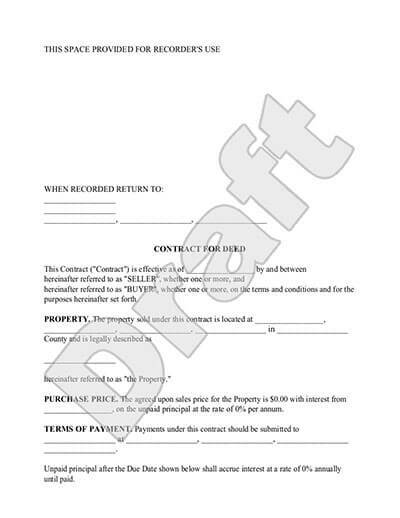 You can create this type of property sales agreement easily using our Contract for Deed online document interview tool. Using our document builder, you can quickly create a legal contract that outlines sales terms, payment terms, insurance requirements and more. Our Contract for Deed contracts are suitable for most types of property including residential, commercial property, land and farmland. These documents can be made suitable for all 50 states. In Contract for Deed arrangements, the seller acts as the financier to a buyer for a property that they own or have financed themselves. This type of property purchase agreement does not require that the buyer qualifies for bank financing. While it is not prudent to sell your property to someone with poor credit, this type of agreement may be advantageous if the buyer simply doesn't have a large enough down payment for a bank loan yet. Or, a Contract of Deed agreement may be good for the seller when interest rates are high or if the property has been difficult to sell. A typical agreement involves an agreed upon term, usually a few years and a monthly payment. At the end of the term, the buyer would need to qualify for bank financing or make a large balloon payment. The buyer and seller also agree on property responsibilities during the term such as seller access and tax obligations. While the seller holds the title, the buyer receives the benefits of an equitable title. An equitable title gives the buyer nearly the same privileges they would have as an owner unless other agreements are made. 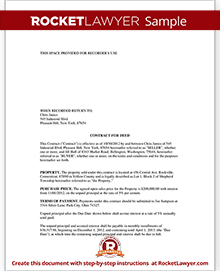 The property address and a legal description of property being sold. The legal description can be found on Seller's title or Deed or may be obtained from a local property tax office. You'll need the full legal names of all parties involved plus their contact information. If buyer and seller reside in different states, you'll need to specify which state laws apply. Include the agreed upon purchase price, down payment amount, interest rate and payment details. You should also outline the payment schedule and how and where payments are to be made. Besides monthly payments, you'll want to define if they will have to pay a final lump sum or balloon payment at the end of the term. For example, some sellers may choose to carry the loan for an agreed upon time, but then require that the buyer obtain another form of financing to purchase the property outright. If the seller has existing loans on the property you'll need to include creditor and loan information. In most cases, the buyer will reside in and use the property as if they were the owner. Which also means, they would be responsible for maintenance. If the seller is responsible for certain repairs, make sure they are listed in the contract with the dates the work is expected to be completed. State who will be responsible for insurance including homeowner, fire, flood and personal property. Also, decide who will be responsible for property tax payments and assessments. Is a Land Contract the same as Rent to Own? Both are suitable for situations where the buyer is not ready to buy the property using bank financing. The major difference is that in a Contract for Deed agreement the buyer usually takes possession of the property as if they bought it. For example, the buyer is often responsible for maintenance, insurance and taxes. Whereas in a Rent to Own Agreement, the buyer is like a leasee and the owner is usually responsible for larger maintenance issues and property taxes. Similarities include that the contract may be canceled for nonpayment or if the seller experiences a foreclosure. In most cases, the advantages lie on the side of the buyer since they would not be able to qualify for the purchase on their own. But there are a few incentives for sellers. For example, when real estate interest rates are high enough that people are putting off buying, you may be able to sell your property by offering a lower interest rate. If you have been trying to sell a vacant property for a long time, a Contract for Deed agreement, like a Lease to Own agreement, will give you immediate ongoing income for a property that was just costing you money. The largest advantage for the buyer is that you don't have to qualify for bank financing. You can get into the property quickly without a large down payment, you can make improvements on the property, you may receive tax advantages, and you have time to improve your credit situation. You may also benefit from a lower than market interest rate. Advantages for commercial buyers is that you can lease the properties to cover the cost of the agreement, perhaps even with a profit. However, there are some cons. For example, if the owner loses the property from foreclosure or death you'd be out all the payments you made in most cases. Or, you may be ready to buy and find out there are issues with the title or that the owner has liens on the property. If you have any questions about Contract for Deeds, we can connect you with a lawyer for quick answers or a document review. Our step-by-step interview process makes creating a printable Contract for Deed easy.